I thought I would re visit an old post of mine that I published nearly 2 years ago now where I spoke about my favourite products for the winter season especially for dry skin and so I thought, while it's still chilly and my skin is still dry I would share with you some of those products I've been loving. 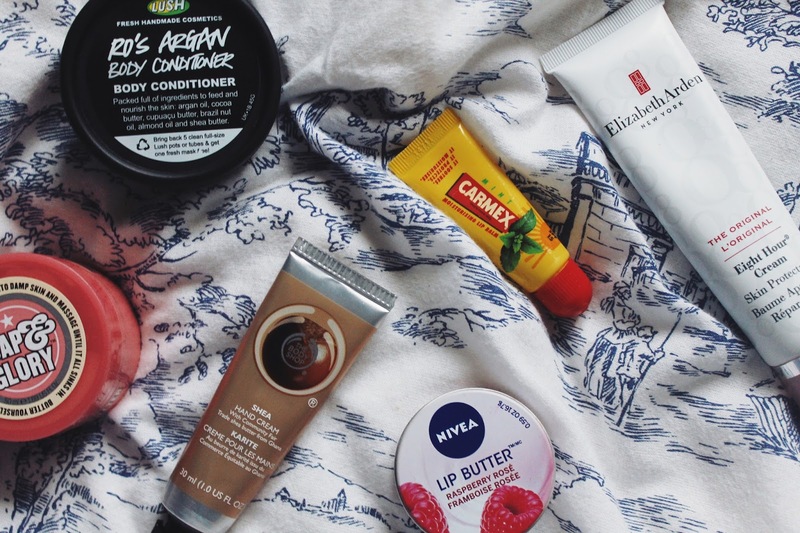 I tend to always carry a lip balm around with me due to the abundance of flakiness I seem to get on my lips and my go-to lip balms are the Carmex Lip Balm and the Nivea Lip Butter. They're both easy to throw in your handbag and hydrate your lips on the go. Due to the flakiness, an exfoliator is always good and the only one I've ever used and still love is the Lush Lip Scrub in bubblegum. It does it's job is a quick fix to remove any dry bits on your lips. A new addition that I have been loving that, while isn't travel friendly, I carry around in my bag is the Elizabeth Arden 8 Hour Cream. This can be used for dry patches wherever needed but I bought it to use mainly on my lips. It's not something I' usually splash out on but I need to find something that will finally get rid of my constant dry lips and I think this is working! Another new purchase that I've been loving for my skin is the Lush In Shower Ro's Argan Body Conditioner. I've used my fair share of in shower moisturisers but this one trumps them all really softening my skin and even going as far as to help my bumpy arm condition (scientifically known as keratosis pilaris aka chicken skin) which really does annoy me. I'm thinking of doing a whole post on products that help me with this so let me know if you'd be interested. Out of the shower Soap & Glory's Righteous Butter is one of my favourite body lotions. The smell is amazing but it also hydrates my skin even more. This with the skin conditioner leaves my feeling like a silk blanket! I've become obsessed with the Body Shop Hand Creams, which I've mentioned before. It's one of those products that if I'm in reach of in the shop, I will have to pick up another to re stock. My favourite scent is the Shea. There just a few more products that I constantly reach for in the winter months. If you want some more suggestions please have a look at the original Winter SOS post. What products do you reach for in the winter?